Mininova Makes Remote Torrent Downloads Much Easier With Personal Bookmarks | OhGizmo! By Andrew Liszewski on 07/10/08 • Leave a comment! How many times have you been at work browsing a popular torrent site when you find the latest (insert name of legally shared file) that you just had to get. But unfortunately downloading torrents at work is a no-no, and acronyms like VNC mean nothing to you. That’s why BitTorrent site Mininova has added a new personal bookmarks feature for logged-in users. 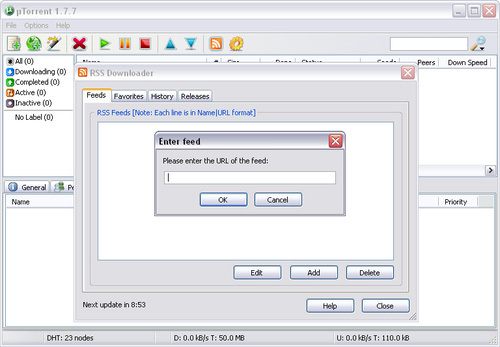 Not only does it allow you to create a list of your favorite torrents wherever you happen to be, but it also provides them as an RSS feed. So if you’re using a BitTorrent client like uTorrent at home, you can actually subscribe to your personal Mininova bookmarks and every time you add a new torrent to the list it should automatically start downloading the next time uTorrent refreshes the feed.